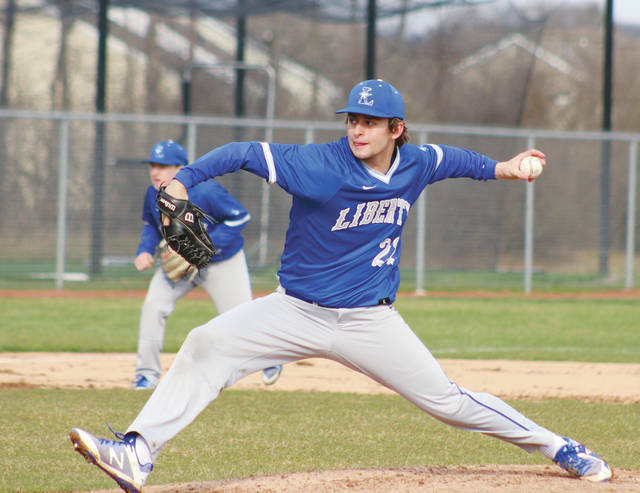 Liberty’s Mitch Milheim fires a pitch toward home plate during Thursday’s OCC opener against host Orange. Milheim allowed just three hits en route to a complete-game win. Batters trying to work the count against Olentangy Liberty pitcher Mitch Milheim might not be standing in the box very long. He provided the evidence to back up that statement in the Patriots’ 3-1 victory at rival Olentangy Orange in the OCC-Buckeye baseball opener for both squads Thursday in Lewis Center. Milheim took a no-hitter into the fifth inning before a Jack Betz seeing-eye single through the hole to right finally broke it up. Connor Evan’s infield hit later in the frame scored Betz to give the Pioneers their only run. Milheim allowed three hits in all and threw 19 first-pitch strikes to 26 overall batters, throwing 67 of his 105 pitches for strikes in the complete-game victory. He finished with seven strikeouts, a pair of walks and a hit batter for the Patriots (6-0, 1-0). His counterpart, Jackson Tyler, was pretty good in his own right. He went the full seven innings, allowing three hits and four walks. He threw 67 of his 104 pitches for strikes, including 17 on the first pitch against the 29 batters he faced. His three runs were all unearned, however. Craig Lutwen scored the first Patriot run on a Corey Mayer base hit in the second inning. It was the fourth inning that proved costly for the Pioneers. Liberty scored twice without the benefit of a hit. Mayer and Carson Comer opened the frame with back-to-back walks before an error on a Corbin Parrish sacrifice bunt scored Mayer. Mitchell Okuley drove in Comer with a sacrifice fly. Betz reached all three times up at the plate for the Pioneers (2-3, 0-1), recording two hits and a walk. Both teams continue league play today at 5 p.m. Liberty hosts Westerville South while Orange visits Westerville Central.